It is January! It’s time to start the New Year off right. Like most people, we are starting with a new diet plan. I have been seeing a lot of good things about the “Paleo”, or “Caveman”, diet so we are giving that a shot this year. Of course, we will be modifying it a bit as we go through the year. There’s no way that either of us could go all year without bread of some sort! Our intent is to eat the way we were meant to. In our monthly meal plan for January, we focus on meat and veggies, filling up on nutrient dense food rather than on heavy starches. On special occasions or just periodically, we can treat ourselves to those heavier items. Since we buy so much of our produce at Sam’s Club, it shouldn’t really affect our monthly budget too much and, hopefully, we can live fuller and richer lives with fewer doctor’s bills! 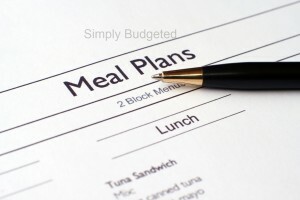 In addition to the food itself, our monthly meal plan takes into consideration the time that we have to do things. We know that we need something simple and predictable each week and we know which days we have to experiment a little. Mondays will still be meatless, Tuesdays will be “stir fry” day, Wednesday and Fridays will be soup days (so nice for staying warm in coooold January), and Thursday will be just simple meat and veggies. Saturday will be our “nice meal” day and Sundays will work to use up the leftovers from Saturdays meals. We hope that this approach will allow us to actually save money with fresh produce because we will actually use all of produce for soups and stir fries and throw out less fresh produce and leftovers. If you are new to monthly meal planning, I want to make sure that you know that this is just our plan for the month. If we don’t have a plan, who knows what we’ll be eating. With a good solid plan, we can stay on track and save time and money each week by having our shopping lists basically take care of themselves. Our plan may adjust throughout the month if some really great piece of meat goes on a great sale or the store is out of broccoli, but with a plan, we have something to adjust from and we aren’t making it up as we go along. We hope you enjoy what we have to offer. Thanks! This week we are making great use of leftover ham from the holidays and some chicken that we bought on sale and froze a few months back. These are easy, cheap meals that anyone can make at home. Leftovers from Saturday’s dinner make an appearance early this week and broccoli, green onions, bell peppers, and other leftover green veggies fill our frittata. This week is all about emptying out that fridge! Who says that eating healthy has to be boring? Sweet butternut squash with tomatoes and other veggies bake together beautifully and sweet potatoes, turkey, and flavorful soup round out the week. Plus we end with steaks and shrimp!! YUM!! We are going to use pork all week here after making a beautiful roast. Leftovers will probably be served with the onion soup (you know that stuff that they serve at Japanese restaurants). Yummy chicken leg quarters in the crockpot round out the week! This week starts with Acorn Squash stuffed with vegetables and leftover chicken from the night before. Large portobella mushrooms marinated and dry rubbed make great steaks when grilled up right. The rest of the week includes easy meals that take very little time to make!